A fast blade-tip speed (up to 16889 fpm) ensures clean cutting and fine shredding of material. Flat blades are effective for any materials not downed and require suction for lifting. 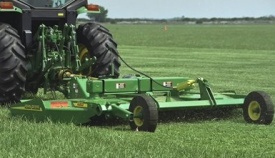 Flat blades require less horsepower and have a cutting edge on both sides. Only available with double-blade system. Dual blades are effective for increased shredding of crop residue. The dual blades consist of a 1.3-cm x 10.2-cm (1/2-in. x 4-in.) lower suction blade and a 1.3-cm x 7.6-cm (1/2-in. x 3-in.) upper suction blade. 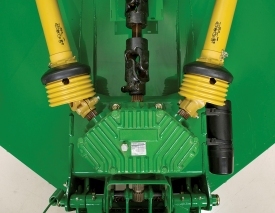 The lift-type versions fit tractors with Category 2, 3, or 3N 3-point hitches (with or without Quick Hitch). NOTE: The lift-type versions require a larger tractor than other versions. For HX10 Lift-Type Rotary Cutters, the minimum-size tractor recommended is a 6020 Series or equivalent. For HX14 Lift-Type Rotary Cutters, the minimum-size tractor recommended is a 7720 or equivalent. Refer to the tractor's operator's manual for ballasting instructions. The pull-type versions of the HX10 Multi-Spindle Rotary Cutter require a tractor with a minimum of 50 power take-off (PTO) hp. 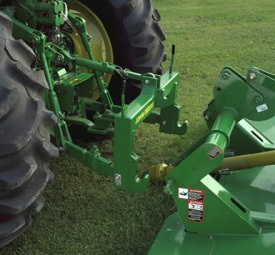 The HX14 pull-type versions require a tractor with a minimum of 60 PTO hp. Note that the type and volume of material being cut affect horsepower requirements. Parallel lift linkage helps keep the cutter level through all height adjustments. 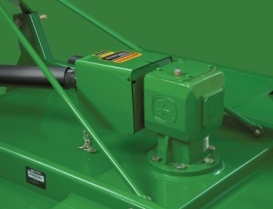 Cylinders are John Deere manufactured, meaning more reliability and durability. Heavy-duty, tapered roller bearings and precision gears help ensure long life. Output shafts are splined, not just keyed, for extra strength and durability. Gearcases mount on heavy-duty bowl supports, which are continuously welded to the top and bottom decks. These bowls provide a lifelong base of support for the gearcase/blade holder mechanism. The HX14 comes standard with five year warranty. The patented Double-Decker design improves strength and cutting performance while reducing top deck rust. Two welded decks include a 3-mm (11-gauge, 0.118-in.) to 3.5-mm (10-gauge, 0.138-in.) thick upper deck, depending on the model, and a 3-mm (11-gauge, 0.118-in.) to 4.5-mm (7-gauge, 0.177-in.) thick lower deck, depending on the model. Internal stiffeners are sandwiched between the decks to add extra strength and rigidity. The Double-Decker design also provides a sturdy base to support the gearcases. Gearcases need this sturdy base to resist the bending loads imposed upon them when blades contact immovable objects or the ground. The bottom deck is the main defense against rocks and field debris, to help protect the top deck from impacts so it will retain its smooth form.